Please note that starting January 2020 there will be slight adaptions of the itinerary. The tour will then last 9 days/8 nights. For further information contact us! Arrival in Buenos Aires and transfer to the hotel. In the evening dinner and tango show at tango house La Ventana (on shared basis). During the excursion you can opt between a tango lesson with specialized teachers or a wine tasting session of different Argentinean wines. Half day city tour in Buenos Aires to visit the main sights with a stop at the famous Café Tortoni, the oldest literati café of the city. Enjoy a cup of coffee & snack. Optional: Argentina culinary experience, an introduction to the best of Argentine cuisine and culture (on shared basis). Flight to Ushuaia and transfer to the hotel. In the morning half day excusion to visit the National Park Tierra del Fuego. In the afternoon trekking tour at Isla Martillo and Estancia Harberton Tour or Penguin Colony navigation Tour including lunch (in case the trekking tour is not available), both excursions in the afternoon are on shared basis. Flight to El Calafate and transfer to the hotel. Full day excursion to the Perito Moreno Glacier (on shared basis). 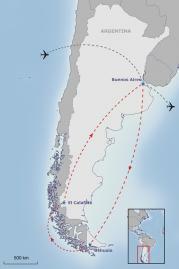 Flight to Buenos Aires and transfer to the hotel. End of the roundtrip. Transfer to the airport and departure flight or post-tour. or request any further customized extension package. For this journey we guarantee a maximum group size of 16 pax.